Bettas are bright, colorful fish which are easy to care for and make perfect beginner fish. The majority of people assume that Bettas like to live in small enclosed spaces such as vases and bowls; however you’ll find they thrive in larger tanks with more open water swimming space. Most people keep them alone due to their sometimes aggressive nature and so this is another reason small tanks are often preferred. 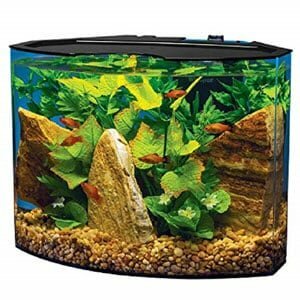 Whilst there are a huge range of novelty fish tanks available such as clocks and tiny bowls, we don’t advise that you keep fish in these types of tanks – they are just too small. Anything less than 5 gallons is not advisable. In this complete guide to Betta fish tanks we detail exactly what makes the best tank before reviewing the most popular tanks available at the moment. Before we go into more detail about each of the 7 best Betta fish tanks, let’s take a look at factors which might influence your decision when choosing your tank. If you already know your stuff and the setup you have in mind, you can skip straight to our review section here. Which is the Best Betta Fish Tank (Summary)? Just like any other aquarium, you will need to set up your fish tank and complete a full cycle to establish the right bacteria to break down ammonia and nitrites. It should also have a heater and a filter (more on this later). Bettas like having plenty of spaces to hide and rest so you might want to include live plants such as Java Moss and Java Fern as well as rocks and caves. The substrate that you choose is entirely up to you; you can choose sand or fine gravel. Don’t choose any substrate with hard sharp edges because the Bettas’ fins are very delicate. We mentioned above briefly that Bettas should not be kept in tiny novelty tanks which are less than 5 gallons. It’s a common misconception that because they are native to the rice paddies and shallow streams of Asia that they only need tiny tanks. This isn’t true; these rice paddies are huge and they have plenty of space to move around. Another reason tiny bowls are unacceptable is because you won’t be able to keep the water parameters stable and ammonia spikes can occur very quickly. Ammonia spikes are much more likely to happen in containers with a smaller water capacity. Keeping your Betta in a minimum of 5 gallons (bigger if possible) will provide them with more swimming space and will also be more visually appealing for you to look at. 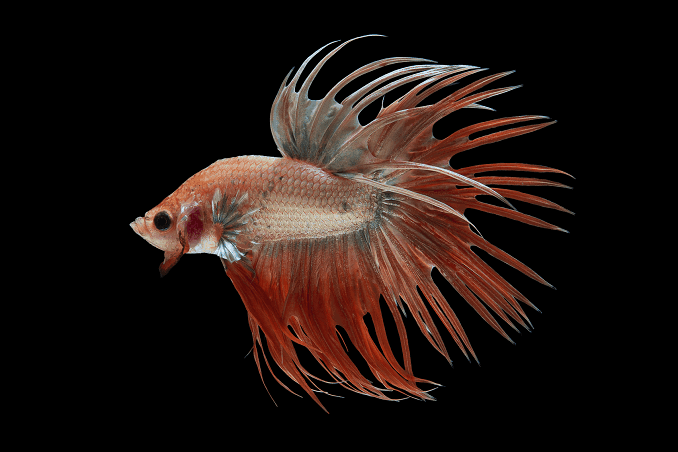 There are plenty of different species of Bettas, including the very popular Crowntail Betta, and most of them require at least a 5 gallon tank. Some require larger so make sure you research the particular species you want to keep. If you’re keeping just one, a great sized tank is a 10 gallon tank. 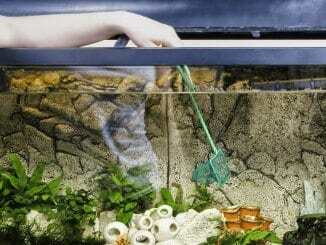 This provides a large enough space for them, the water conditions should stay stable, and it won’t require as much maintenance as a smaller 5 gallon tank. 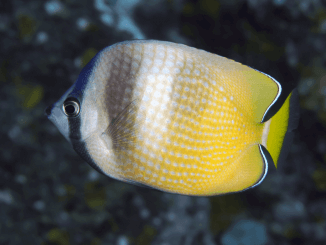 Again, another common misconception for housing Bettas comes from the belief that living in shallow waters means the water must be dirty – so they can handle dirty tank water. This is wrong, their natural environment is actually part of a large bio-diverse ecosystem and the water is clean and well oxygenated by plenty of plants. Bettas are labyrinth fish which means they can take oxygen in from the air. This allows them to jump from puddle to puddle in their natural environment until they reach a larger body of water. Some people presume that because they can breathe air – the size of their house doesn’t matter. Breathing air should only ever be a temporary solution for them. Whilst they can survive in small cups and other smaller tanks (just like they do in a puddle), they will certainly not thrive and we don’t recommend this. They need an oxygen rich environment, and a filter will provide this. If you choose not to include a filter (which again, we really don’t recommend) make sure you carry out a partial water change around 40% every three days). A problem you might experience with lots of filters is that they will create a water flow which is too harsh for Bettas. This can easily be fixed by placing a pre-filter or a sponge at the outlet. Many Betta owners believe they can be kept without a heater. Their natural environment in Thailand and Cambodia is really warm; you should keep your tank above 76°F. Again, this is another reason that a small bowl or tank is impracticable, because you wouldn’t be able to use heaters or filters. The only exception to needing a heater is if you live in a year round warm climate where the temperature of the fish tank will stay constant and above 76°F. You should also place a thermometer at the opposite end of the tank to the heater; this ensures that the tank water stays are the correct temperature throughout. The ideal temperature is between 78°F and 80°F. 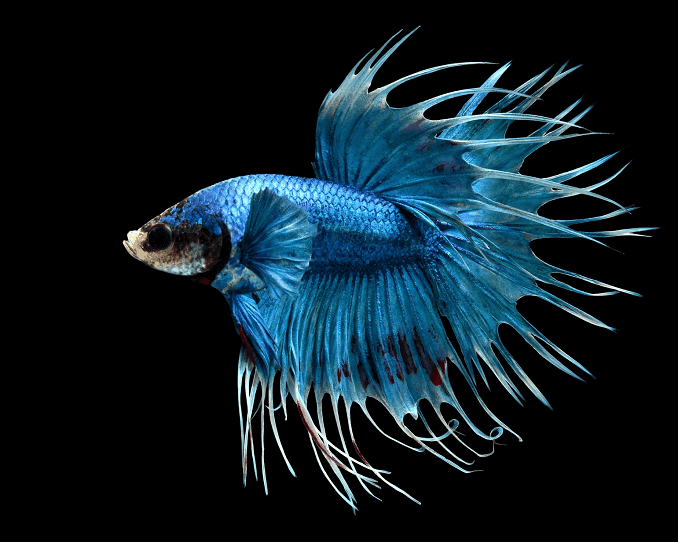 Now we’ve taken a look at the essential things to know about your Betta fish tank, let’s move onto the reviews. We’ve provided you with a range of tanks, from easily affordable to more luxurious, and from small to large tanks – there is something to suit every fish keeper. Available in either a 10 or 20 gallon tank, this is a great sized starter tank and includes everything you need as a beginner. This starter kit is available in both 10 and 20 gallons. It comes with complete easy to follow instructions. It is the most complete tank within this review and comes with a glass aquarium, LED lights in the hood, a filter with media, heater, fish food, water conditioner and a fish net. The filter has an LED light which flashes when it’s time to change the cartridge. The preset submersible heater is shatter resistant and has an auto safety shut-off feature. This is probably the most fail-proof option if you’re new to fish keeping and want everything in a complete set. You’ll just need to add decorations, gravel and a Betta! Dimensions: 20.25 x 10.5 x 12.5 inches. Great complete starter kit for beginners. Small door in the lid to allow feeding. Comes with everything you need – just add fish! No hinges which would make cleaning easier. Lighting only effective for low light plants. 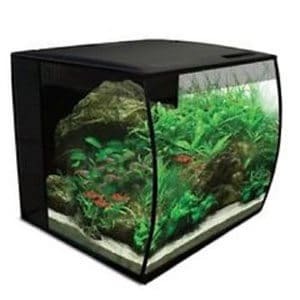 The ultimate tank for Bettas, a beautiful striking cube shaped aquarium, with a well-thought out design. This is the ultimate Betta fish tank. The Fluval Edge is a 6 gallon tank with a very striking design. The cube shaped aquarium is closely embraced by the exterior which makes the aquarium look like its floating in mid-air. The filter and all the wiring is concealed within the column at the back. The top of the tank is also glass, which allows for an almost 360 uninterrupted view of your Betta. 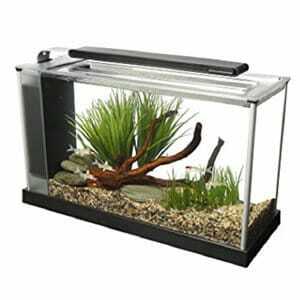 This tank is available in both a 6 gallon and a 12 gallon size. The 6 gallon tank comes with lighting (21 LED bulbs) and a Fluval power filter which allows the water to pass through mechanical, chemical and biological medias. Dimensions: 13.7 x 17 x 14.3 inches. Wires can be hidden at the back. LED lights only ideal for low light plants. Deep tank makes it difficult to get large decorations in and out. This great beginner aquarium features a curved front and comes complete with hidden LED’s and a filter. This is the cheapest complete kit that we are featuring in this review, so if have a small budget – this tank is for you. Tetra is a well-known brand within the fish world and has a good reputation. 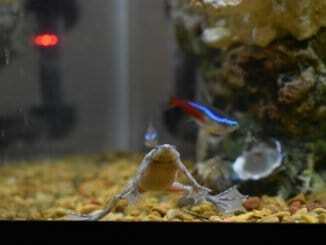 The kit includes a 5 gallon tank with hidden LED’s to light up your aquarium, and a mechanical filter. The tank has a curved front which gives it a stylish edge and fits in well in most living rooms, bedrooms and workplaces. You’ll also need to buy a heater to go with this tank. Straight forward and easy set up. Crescent shaped front allows for nice viewing. Quiet filter and easy to replace media. Uncovered feeding area at the front (can easily be covered with mesh). Lid is flimsy and looks cheap. Can scratch quite easily being acrylic. 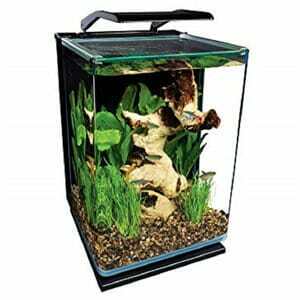 A reasonably priced starter aquarium kit which has a hinged light and a filter with adjustable flow. This next aquarium is only slightly more expensive than the last one. 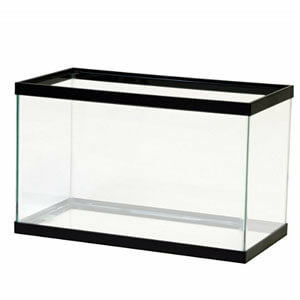 This 5 gallon modern tank has curved glass and rounded corners. It has a black base and back (where the filter hides) and a unique glass lid which slides in and out. It has a hinged light to allow you easy access when you need it. The lights are LED and have a couple of settings; the white lights produce a shimmering light for the daytime and the blue lights create a relaxing moonlight glow for the evening. There is also a setting to switch the lights off completely. The filter is hidden in the back panel to keep it out of sight and it also has an adjustable flow. The filter is their own brand – MarineLand’s 3-stage hidden filter with Bio-Foam, a Rite-Size Z cartridge and a pump. Takes up less space than longer tanks. Unique lid design – great to deter nosey cats. Filter is quiet and easy to buy media for. Self-contained filter is difficult to clean. Filter area takes space away from the tank. Horizontal supports are quite sharp. Filter creates a strong current. Black plastic cover for the filter area is flimsy. Contemporary tank which features a sleek overhanding lighting system and a powerful pump and filter. This is the best 5 gallon option there is to use for your Betta fish tank. This glass tank has aluminum trim around the corners giving it a very contemporary look. The slim and long shape provides a great space for Bettas to swim horizontally. It comes with a sleek overhanging lighting system which has 37 LED lights. It also has a powerful adjustable circulation pump and a 3 stage filter. The filter comes with a foam block, activated carbon and biomax rings to ensure effective filtration in all three areas; mechanical, chemical and biological. The flow created by the filter is a little too powerful for Bettas; we advise using a pre-filter sponge to reduce the flow of the water. Sleek narrow design, fits well on smaller surfaces. Great lighting for easy viewing. Plenty of horizontal space for Betta to swim. At times flow can be too powerful for Bettas. No ideal place to put the heater. Have to take light bar off for any maintenance work. Lights aren’t strong enough for most plants. 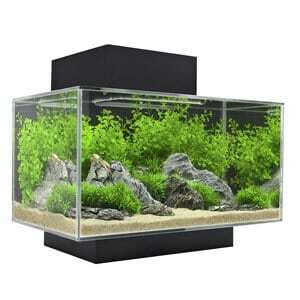 A quality glass aquarium perfect for those wanting to add their own equipment. This is the cheapest option that we’re listing BUT, it doesn’t come as a kit. If you take the rest of the equipment into account – it definitely won’t work out as the cheapest! We’ve included it just in case you have specific equipment in mind and you’re just looking for a tank on its own. That way you can buy all the equipment that you want from brands that you trust. It isn’t anything very fancy, just a plain glass rectangular shaped tank. 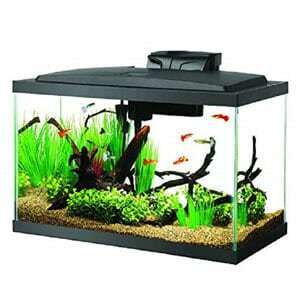 If you choose a tank like this, you’ll need to buy your own: lid, filter lights and heater. Very affordable if you already have additional equipment (heater, filter etc). Can be used as a quarantine tank. Doesn’t come with a lid. Not a complete kit so you’d need to buy heater and filter. A large 15 gallon tank which is perfect for Bettas, great design and comes complete with lights and filter. If you’re looking for a larger home than any of the tanks we’ve featured for your Betta – this will be perfect for you. It comes with a powerful 3 stage filter which cleans the water effectively through mechanical, chemical and biological media. It has a truly unique curved front which sharply contrasts the straight sides. It comes with LED lighting which can be controlled through a remote control to many different settings including faded cloud, and lightening effect. As you’d expect from a top-end tank, it has lots of well-thought out ideas, such as the grid pattern around the top of the tank which reduces the visibility of the water line. Really great design with a convex front wall. Large 15 gallon capacity offers your Bettas lots of space to swim and play. All wires can be hidden behind the center of the tank. Plenty of space to add heater or additional filtration. Lots of different lighting effects. The hood is slightly flimsy. The black plastic back scratches easily. By now you know that, contrary to common belief, Bettas are beautiful fish which come in a wide variety of colors, and they cannot be housed in tiny bowls or small gimmicky tanks that are less than 5 gallons. Hopefully you’ll have a good idea of which size tank you’d like to house your new fish in. The tank you choose will mostly depend on your budget, but also what you find looks the best. If you’re on a budget, the Tetra Crescent Acrylic Aquarium and the Marineland tanks are great and will make the perfect home for Bettas. Both of these tanks offer great value for money. If you aren’t on a budget, and are looking for a top quality, top-end Betta fish tank we recommend the Fluval Edge. It offers plenty of space for open water swimming and enough space to add plants and other decorations which will provide great hiding places. Recently returning to aquarium keeping. Great site with factual info. Swimmingly good! Can beta fish live in peace with other fish like neons? If I buy a 5 gallon can I put my Betta fish with other fish like the tropical fish ?? And how many ? If so.. This was a really helpful article! I is there a particular type of shrimp you would recommend placing in a 5 gallon tank with a betta? Great article! The only issue is that that I’ve numerously heard that the Fluval Edge is a horrible tank for Bettas because the water fills to the very top and that means that they don’t have much space to swim to the top and gulp for air. Also, the only air opening they have is situated right next to the filter, which makes it very difficult for them to swim up there. It’s shame because I want to get into the hobby and a FluvalEdge/Betta systems would look great! What do you think? Both of my girls really want betas. If we went with the fluval 12 gallon is there a way to separate the tank so they both could stay there? I really don’t want to maintain or find space for two tanks.